Within Japan Humanity and Paper Balloons has long been celebrated as one of the greatest films ever made, as well as one of the most significant films in the jidai-geki, or period drama, genre. Internationally, however, it has remained obscure until very recently. Part of its problem is that its director, Sadao Yamanaka, died a year after making it. While his contemporaries – Ozu, Naruse and Mizoguchi – all continued to direct movies right through the 1950s, by the time international audiences were exposed to Japanese films Yamanaka was long gone. 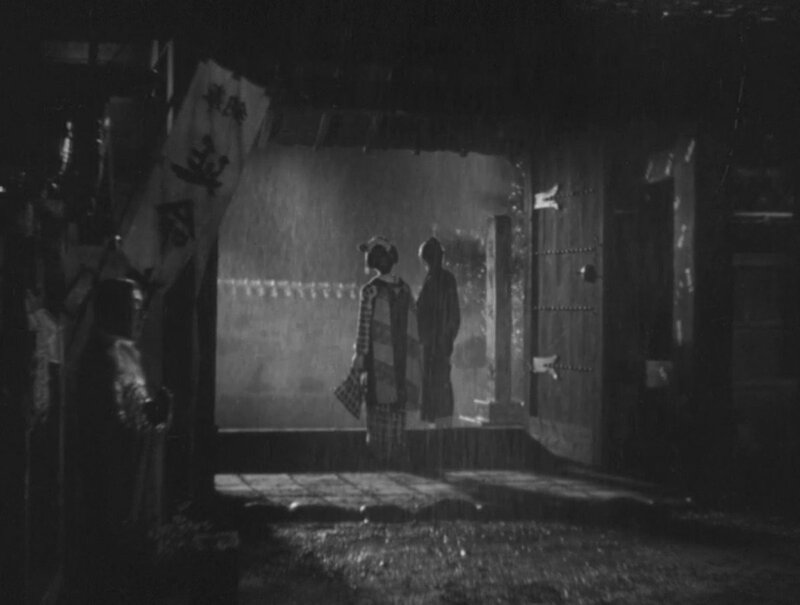 As a filmmaker whose works were all produced and released prior to World War II, Yamanaka also suffers very badly from a lack of extant prints. The early cinema of most countries is riddled with gaps and incomplete prints, whether due to fragile – not to mention highly combustible – prints, poor storage conditions or damage from the elements. In Japan the situation is much worse, thanks to the Great Kanto Earthquake of 1923, the fire-bombing of Tokyo, and post-war censorship by the occupying American military (which often meant simply burning prints rather than storing them). Working entirely before the firebombing and the foreign censors, all of Yamanaka’s works were exposed to destructive risk. In a blisteringly fast six-year career he directed 22 films. Of those, only three maystill be viewed today: The Million Ryo Pot (1935), Kochiyama Soshun (1936) and Humanity and Paper Balloons (1937). Yamanaka was 23 when he directed his first film and only 29 when he died from dysentery on the Manchurian Front. Had he survived, he might have changed the face of Japanese cinema both at home and around the world. The 1930s marked the most turbulent decade for Japan since the Meiji Restoration of the late 1860s. The decade began with widespread unemployment, economic depression and labour strikes. Public dissatisfaction opened a door for aggressively conservative nationalism. 1931 witnessed two attempted military coup d’états of the Japanese government and the Japanese invasion of the Chinese province of Manchuria – renamed Manchukuo by the Japanese. A third attempt at a coup occurred in 1932, and a fourth in 1936. Over the course of the decade the Japanese Parliament was progressively weakened while Japan’s army gained both political weight and popular support. By July 1937 Japanese expansions into China sparked total conflict between the two nations. This second Sino-Japanese War would run until the end of World War II. Immediately prior to the outbreak of war it seemed possible that public discontent with the armed forces would create a popular shift back to a more egalitarian democracy, however the war stopped this process in its tracks. One of the key elements of 1930s Japanese nationalism was its focus upon the past. This strong drive to celebrate and emulate the cultural traditions of the 19th and earlier centuries made the jidai-geki – a style of historical feudal drama involving nobles and samurai – the most popular form of mass entertainment in the country. Faced with this growing demand Japan’s studios – Shochiku, Toho and Nikkatsu – pushed more and more jidai-geki into production. Riding the crest of this wave, by virtue of both talent and circumstance, was Sadao Yamanaka. Early Japanese cinema employed an apprenticeship process. Young aspiring filmmakers would be assigned to an older, more experienced writer or director, and was expected to learn on the job while helping to make their films. 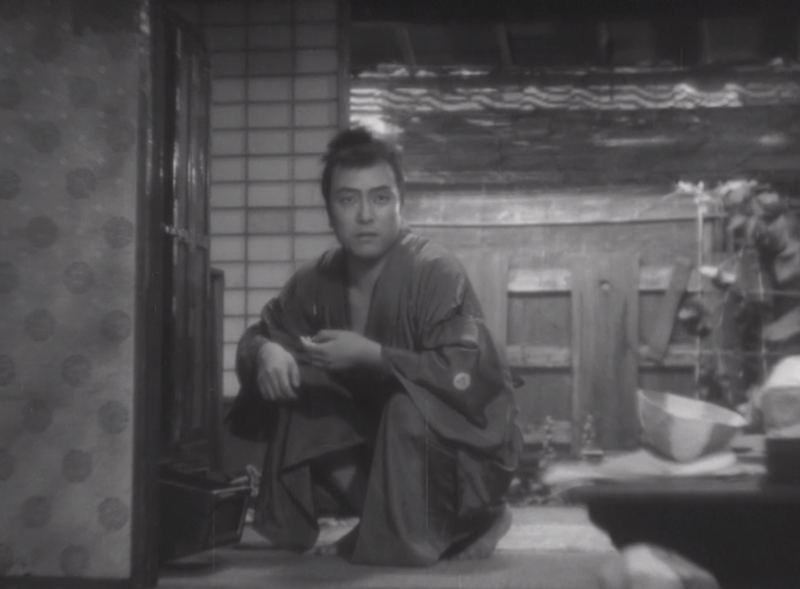 It was in this sort of apprenticeship arrangement that Sadao Yamanaka entered the film industry, working for a small independent studio in Kyoto. After demonstrating strong talent in directing, he was assigned his first film in 1931, aged just 22. He directed five films in his first year, all jidai-geki and all starring actor and producer Kanjuro Arashi. In 1933 Yamanaka moved to one of Japan’s two main film studios, Nikkatsu, where he would spend the bulk of his career directing other early movie stars including Denjiro Okochi and Chiezo Kataoka. He only directed jidai-geki, either pigeonholed by early successes in the genre or genuinely interested in what the genre offered. He also never left Kyoto: every single one of his films was shot there. 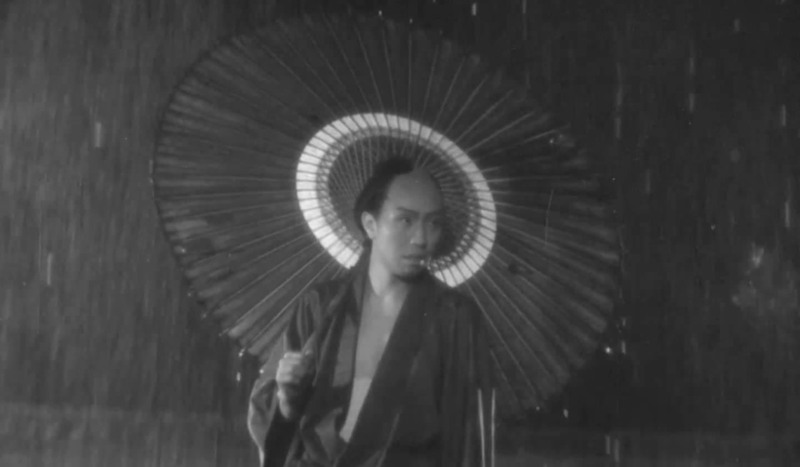 Yamanaka was noted by critics of the time for drawing on foreign films as well as his Japanese forebears and contemporaries, and effectively developing a ‘best of both worlds’ approach: distinctly Japanese stories in form and tone, but presented in a visual method more akin to the films of Europe and the USA. 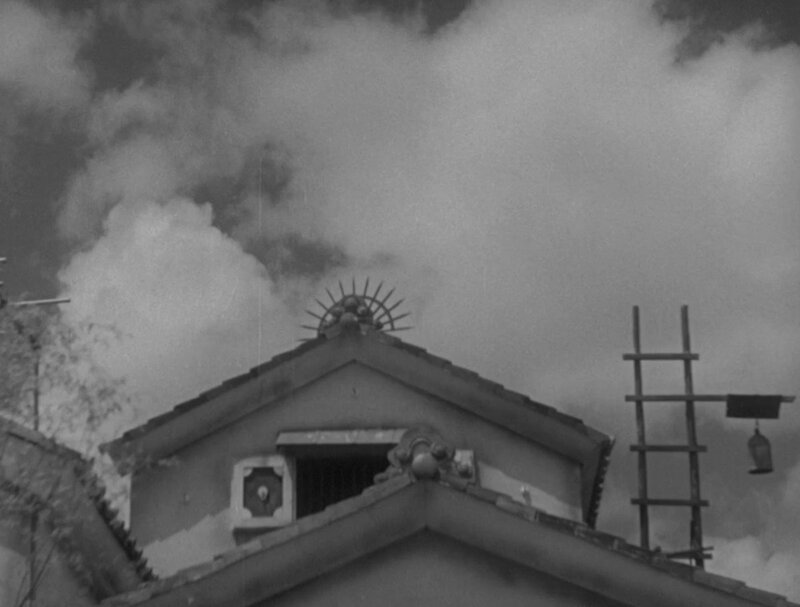 Working within the comparative safety of a period film allowed Yamanaka the opportunity to subtly comment on contemporary political and social issues without drawing overt attention at the same time. It was a technique used for centuries by writers and artists of all cultures and persuasions; particularly those operating under oppressive regimes. It was a way of ‘softening the blow’ when pointing out social failures or criticizing government policies. Of particular interest to Yamanaka was the emphasis of ninjo (compassion) over giri (duty). For the broader nationalistic culture around him, the emphasis was very much the other way around: a strong sense of ‘national community’ developed over the course of the 1930s, placing the good of the country and the broader community far ahead of the needs of the individual. In small ways Yamanaka was able to challenge this concept, and as a result his films carry with them an unexpectedly humanistic sense. Humanity and Paper Balloons adapts a kabuki play by Kawatake Mokuami. The original four-act play, titled The Tale of the Old Wet Coat, was first produced in 1873. It formed part of a genre known as kizewamono, or ‘raw life play’, that depicted lower strata of Japanese society such a prostitutes, criminals and the working poor. The play was noted at the time for emphasising ninjo over giri, so it is no surprise that an adaptation interested Yamanaka so keenly. Yamanaka expanded the play’s characters, drawing attention away from its protagonists and creating more of an ensemble piece. In producing the film Yamanaka collaborated with the contemporary theatre troupe Zenshin-za. He had worked with the group twice before, on The Village Tattooed Man (1935, now lost) and Kochiyama Soshun (1936). Zenshin-za established their reputation on modernising kabuki standards, particularly after growing government censorship forbade them from performing left-wing polemical works and poor box office receipts left them unable to present anything from the avant-garde. Yamanaka’s collaborations with Zenshin-za, however, are telling: they situate him as a left-wing artist, politically motivated and creatively progressive. His films were made with a social agenda and were aggressively contemporary. It is no wonder Yamanaka was so warmly received by critics and filmmakers at the time. Rather than stage kabuki for the screen or ape American features, he presented a blend of the two: pure Japanese content in a more international form. Onto Humanity and Paper Balloons in more detail. There are two protagonists. The first, Shinza (Kanemon Nakamura) the barber, runs a small-time gambling racket that earns him reprisals from the local authorities. 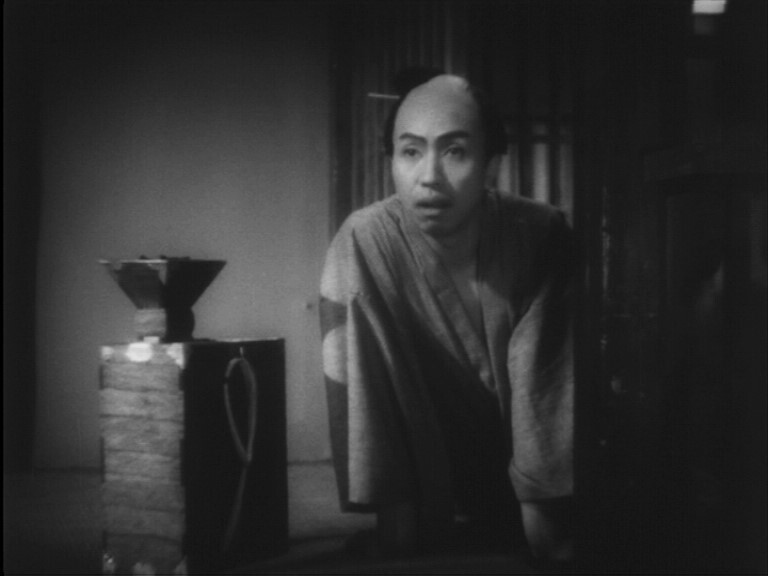 When the village pawnbroker further humiliates him by refusing to loan him money, Shinza retaliates by kidnapping the pawnbroker’s daughter. Shinza cannot hide the daughter in his own home, so he enlists the assistance of his neighbour Matajuro Unno (Chojaro Kawarazaki). Unno is a ronin – a samurai without a master – and his attempts to hand a letter of introduction to the wealthy local samurai Mori have all ended in failure. Unno is also broke, and he and his wife Otaki scrape by from the paper balloons that she stitches together each day (hence the Paper Balloons part of the film’s title). Suffice to say the kidnapping plot does not end well for either protagonist. Yamanaka’s film reverses the traditional roles of jidai-geki. Of the samurai depicted in the film, one is visibly corrupt and dishonourable and the other is an emotionally broken alcoholic. Authority figures are represented as uncaring and dismissive of their village tenants. Shinza is reprimanded and threatened with violence for operating a gambling den not because it is illegal, but because it interferes with his masters’ pre-existing gambling operations. The film seems wilfully transgressive. Rather than glorify bushido and traditional modes of Japanese life, Yamanaka seems to directly challenge them. He depicts samurai as impoverished and fallible men, far removed from the chivalric ideal presented in other films. At the film’s opening a samurai has committed suicide by hanging. One character asks why he didn’t ritually disembowel himself. Another remarks that he couldn’t – he had already sold his sword for a bamboo one so that he could afford to buy food. Shortly into directing Humanity and Paper Balloons, Yamanaka was informed that he had been conscripted into the Imperial Japanese army. Between learning of his fate, and being sent into active service, he made this final film. This many decades on it would be almost impossible to know for certain why he was specifically chosen for conscription, but his left-wing outlook and his subtle condemnation of the powers-that-be must have made him a likely target for reprisals. On the same day that Humanity and Paper Balloons premiered in Tokyo, Yamanaka was officially drafted and dispatched after training to the Manchurian Front. Less than a month later he succumbed to dysentery due to the poor sanitation there. He never saw active service, nor did he ever leave the field hospital. He died on 17 September 1938 from an inflammation in his intestines. It is difficult to watch Humanity and Paper Balloons and not think that Yamanaka’s impending conscription played a heavy hand in dictating its tone. It is a cynical, almost mournful work. There’s no sense of nobility in the characters’ deaths, just an overwhelming feeling that it was deeply sad and worthless. Mimura Shintaro’s screenplay had the film conclude with the local residents celebrating with a party. Yamanaka chose instead to end it with Shinza on his way to his death and Unno’s wife committing a murder-suicide. 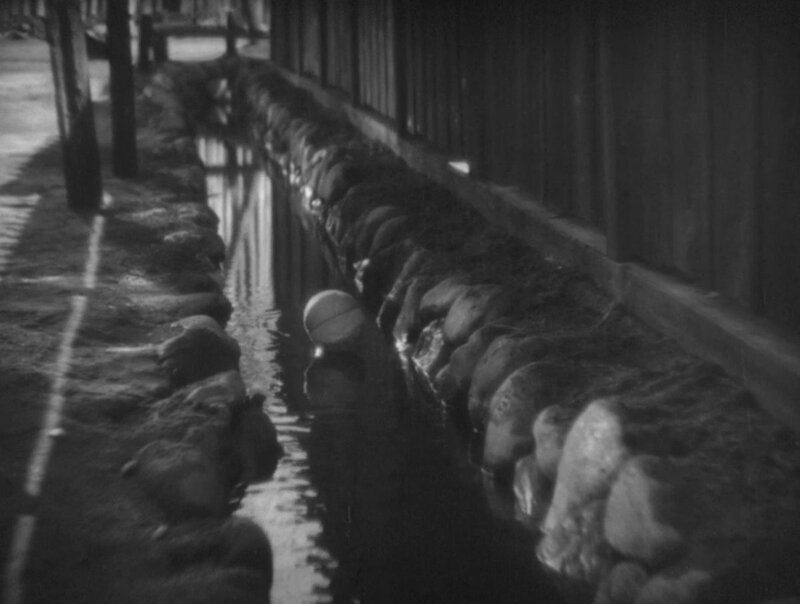 The film’s final shot – one of Otaki’s stitched paper balloons slowly rolling down a gutter – speaks volumes. There was something beautiful once but now it, and hope alongside, is gone. It’s within the tightly knit community of villagers that we may find the humanity referenced in the title. They provide layers of character-based humour and observational comedy, and represent many of the elements – trust, loyalty, integrity – that you’d expect to see among the samurai. Yamanaka also devoted a significant amount of time in developing each as a distinctive character, whether it’s the goldfish seller Genko or the blind Yabuichi or even the harried, widely exploited landlord Chobei. We do not really reach the film’s central plot until we’re halfway through it. Everything in the lead-up serves to create a strong sense of space and community, and – as the film’s title suggests – humanity. 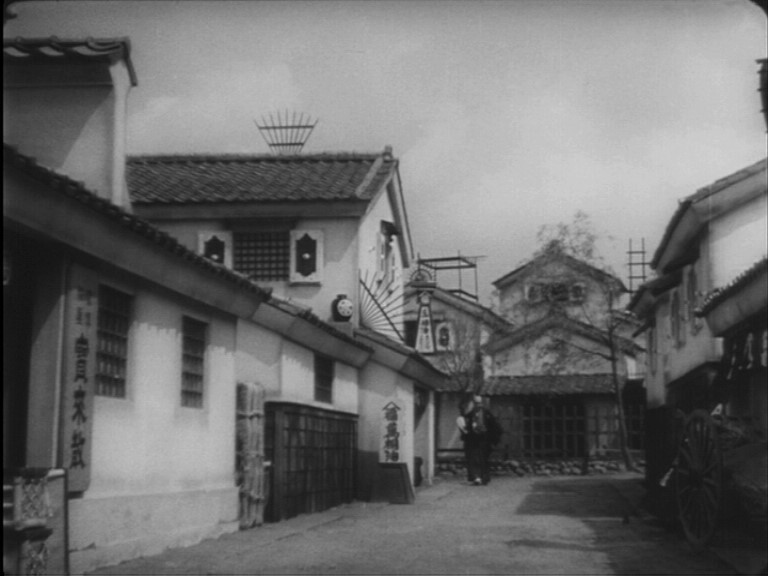 One protracted sequence near the film’s beginning sees Chobei trying to make his way down the village’s main street while being harassed into providing five bottles of sake for the dead samurai’s wake. In addition, he’s being irritated by Genko’s constant cries of ‘goldfish!’, his sandal strap breaks, he gets mud on his feet and a woman accidentally throws a bowl of waste water over his legs. It’s a perfect scene, combining well-played comedy with astute social observations: Chobei resents having to come down among his tenants and get his feet dirty. Yamanaka makes excellent use of ellipsis in showing the viewer exactly what they need to see to understand the story, but nothing more. We see Otaki draw a knife and lean over her husband, but we do not see them die. Similarly the last we see of Shinza is him drawing a knife of his own while standing on a bridge. The fact that the samurai opposite has just drawn a sword leaves little doubt over what happened next. Shinza’s death demonstrates a remarkable serenity that Yamanaka never provides to the film’s wealthier, more powerful characters. He goes with Mori’s henchmen willingly, even taking time to dissuade his neighbours that anything untoward is going on. He politely asks one of the henchmen to return an umbrella to its rightful owner. He does not beg or plead, or attempt to flee. He simply draws his knife against his opponent’s sword and accepts the death to come. The film also achieves some remarkable results in visual terms. Through camera placement, set design and manipulation of the cast, Yananaka has bestowed upon Humanity and Paper Balloons a remarkable amount of depth. Take the opening sequence, that carefully establishes the tenements and backstreets where the film takes place. Yamanaka introduces action in the fore, mid and background. Characters move from the distance right up into mid-shot, and vice versa, while extras and supporting players move back and forth in between. It doesn’t simply give life to the scene, although it certainly delivers a naturalistic edge that films of the period often lacked. It also provides the whole film with a strong sense of geographic space. By the film’s end the average viewer could probably draw a rough map of the village from memory – not a lot of films can create that effect. There is so much sadness here. Sadness from a film with no victors or survivors. Sadness from its creator, dead in a tent a thousand kilometres or more from home. Sadness for Japan, which came so close to pulling back from the brutal militarism that cost so many lives and which would, in just eight short years, bring the entire country to its knees.